E-ON#009 has unofficially been dubbed 'The Verone Issue', as not only did the Veto leader pen a guide to being an effective CEO (above), but also helped out with a look back on all the group stages of the recent Alliance Tournament, which if you missed, you can catch up with here. Looking forward to it. If it was to arrive before Fan Fest it would be even better since at least I could console myself reading through it. OOH yes. EON 9 is verry nice. Ok, ok, that's it rub it in!!!! Glad to hear it's a good one. Looking forward to flip through it! It's a good read and the wall planner will be useful. 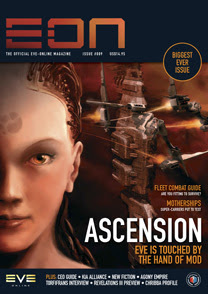 Best bit for me are the stories and I loved the article on the Homeworld Mod. Very nice. I'm hoping it'll be waiting for me when I get back from Atlanta!